This is going to be good... hope to see you there! Judges: Mike Zohn of Obscura Antiques and Oddities and star of The Discovery Channel's Oddities; Robert Marbury of the Minnesota Association of Rogue Taxidermists; Dorian Devins, co-founder and curator of the Secret Science Club; Melissa Milgrom, author of Still Life: Adventures in Taxidermy. Show off your moose head, jarred sea cucumber, rabbit relics, snake skeleton, fish fangs, and other specimens. Compete for prizes and glory! JUST ADDED: Purveyor of scientific wonders and star of the inimitable new show Oddities on the Discovery Channel, Mike Zohn joins the judging panel and presents an illustrated lecture on (yes!) taxidermy. This specialty edition of the Secret Science Club meets Tuesday, December 7 @ the Bell House, 149 7th St. (between 2nd and 3rd avenues) in Gowanus, Brooklyn, p: 718.643.6510 Subway: F to 4th Ave; R to 9th St; F or G to Smith/9th. Please bring ID: 21+. $5 cover. Contest Background: The Carnivorous Nights Taxidermy Contest is hosted by the Secret Science Club, an organization dedicated to exploring scientific discoveries and potent potables. The contest was started in 2005 by two of the Secret Science Club’s co-founders to shamelessly promote their taxidermy-inspired book Carnivorous Nights: On the Trail of the Tasmanian Tiger. The event has since taken on a life of its own, with first-year winners Andrew Templar and Jim Carden—co-owners of the Bell House—now providing a permanent home for this beastly annual smack-down. Special thanks to Robert Marbury of the Minnesota Association of Rogue Taxidermists, the Rump Ape, and Poe the Crow. More here. 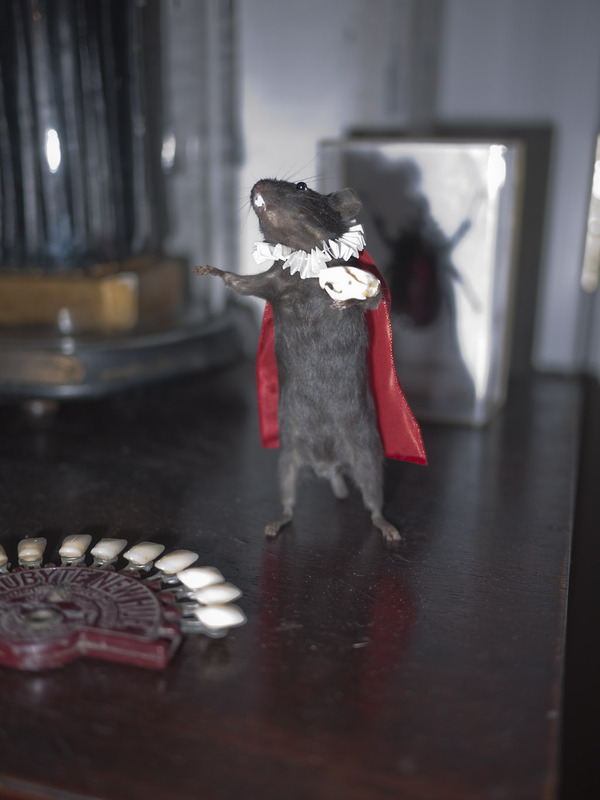 The image you see above is the Hamlet Mouse by Mouse Angel/Jeanie M. You can purchase your very own Hamlet Mouse--or Angel, or Punker Rocker, or Mousealope, or Pope--at The Morbid Anatomy Library; click here or email me here for details.